So there will be those who have been following this blog who have heard me mention this show and wondered what I’ve been going on about. Requiem from the Darkness was a bit of a surprise show for me. 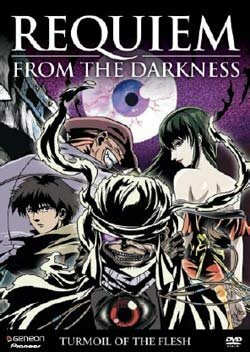 The cover of the first disc kept drawing me when I saw it on the shelf in Gamesman, and so I went to my usual go to site for anime reviews – Anime on DVD.com – and read the glowing review of the first series, which convinced me to watch it. Now AoD has yet to guide me wrong – they suggested that I stick to Argentosoma, and thus I managed to catch one of the best twists in anime. 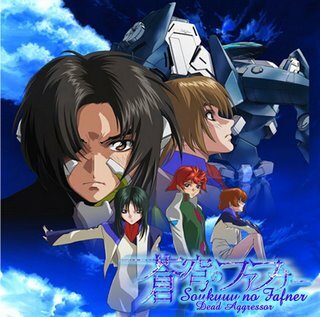 They even gave a good review for Fafner – which is beginning to grow on me. Heck, they convinced me to check out Chrono Crusade, which I was never going to watch – but now I’m actually pleased I did. Requiem’s style is very unusual. Drawing on traditional japanese art and the graphic nature of the pre-manga storyboards that travelling tale-tellers used to carry from town to town – Requiem is certainly an unusual series that wont appeal to everyone. The animation is a bizarre mix of traditional and CG, with many secondary characters being strange caricatures or even symbolic representations of people. There is the hint that their forms are indicative of their true natures, but at times the most normal looking people end up being the true monsters in the series. It is an unusual series that is essentially about telling ghost stories, and really takes its time about it, relishing in each story and making sure that you are always just a little bit uncomfortable. I have to admit, I refuse to watch this series at night, because it genuinely left me feeling disturbed and creeped out. But in a good way that a really well crafted horror story would. I think the makers understood that animation would prove to be a difficult medium to tell horror stories with, and so they opted for some very clever techniques to help create a malevolent atmosphere. Oddly enough, the main characters are so… likable. Even the strange supernatural trio that the story centres around. Yet again this is a devious trick, I feel. By making the characters so likeable… it gives the series that much more of a creepy edge. When they talk so matter-of-factly about a murderer or demon, it feels all the more creepy because they are talking about it as if demonic evil is just so normal in the world. This is a very clever little trick that serves the series well time and again. Don’t get me wrong, these guys are out to purge and punish evil, but the trio have seemed to come to expect people to become evil. Momosuke, the lead, is essentially the pure moral character who is slowly making the shift from naivete to understanding. Nine Worlds – Snakes on a Spaceship! 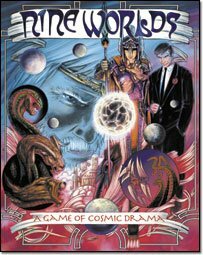 I finally got to run Nine Worlds last night at Nick and Nasia’s. With the demise of Fireborn, I’ve decided that Wednesday would be a better evening for casual gaming, where players can come and go, and we can try out a variety of games just for fun. Unfortunately, I didn’t count on Paul and Nick P being so prone to playing on each other. I should have learnt by now. *sigh* Also didn’t help that I wasn’t particularly in touch with the system – which is very much like Primetime Adventures, but with a bit more depth to the mechanic. Over all, I love the game and with a group of players who are willing to take it seriously – it would be pretty cool. Basically the game was set up with everyone waking up on a spaceship suffering from Amnesia. We managed to get the game moving along a very cool plot line involving Atlantean space pirates and an assassin who had smuggled snakes from Venus to Luna. The system has some odd quirks – stories are only driven by players, the GM just shows up to facilitate and run NPCs. This is kind of cool, but it relies on the players working together during character creation and making sure that their individual storylines link together. Otherwise the game gets messy. I also didn’t like how a lot was kind of left for granted. Even with all the examples of play it was hard to see where the roleplaying came in. When a conflict is resolved everyone takes turns in narrating the outcome (as long as they succeeded) and there was never a clear indication of *how* this worked. Narration seems to often be a third-person perspective thing. Again, the right group would really make this game excel. It has a cool universe and the system really is well suited for that setting. Mood: Setting up for Exalted! Well firstly, I’m kind of digging the theme song of this show – it’s pure J-pop, but I’m liking it. I might use it as the Exalted Theme song for my game. Mwahahaaha! On a more serious note – this show is looking kind of odd. I have a mixed feeling about it. The other issue I have is the shooting gallery line-up of characters. Within the first few episodes the cast has exploded outwards in a manner that suggests there will be a mortality rate. Why do I say this? Well, RX and NGE both had large casts, but they took their time introducing each character and establishing that character’s story. 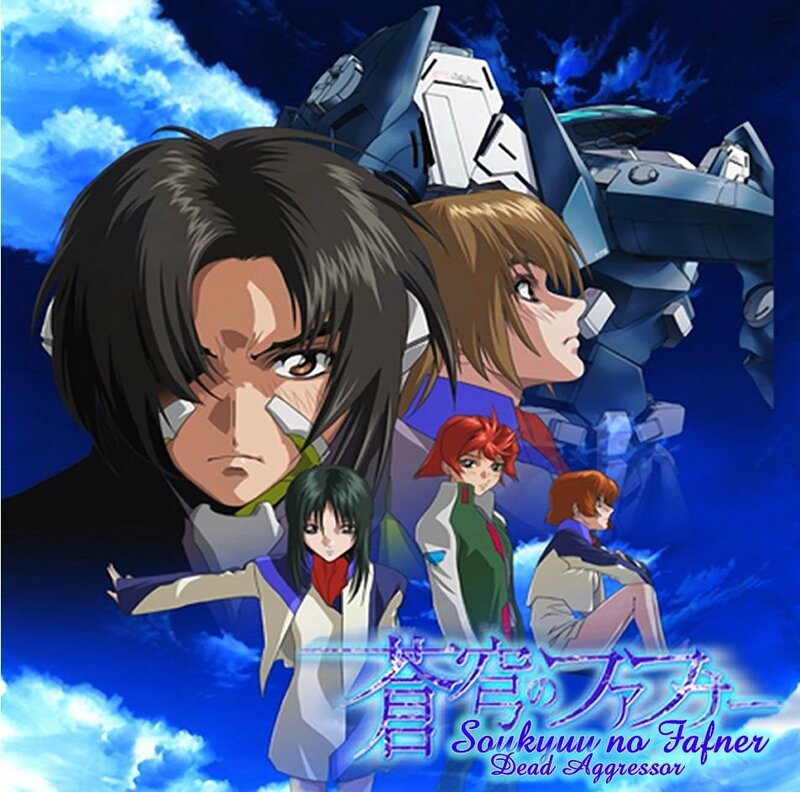 It took me three episodes to realise that the doctor in Fafner is the mother of one of the other characters and that her assistant was actually her other daughter! I keep thinking back to Rah Xephon and how a number of main characters were only introduced as almost side roles and just were gradually brought into the story until they had a focus episode. Even Requiem from the Darkness managed to win me over within the first few episodes. Yep, you read that right. As some of you may know, I’ve been trading up a storm recently to enlarge my anime collection while suffering from a lack of finances. Basically, I’ve been slowly removing items I have no need for so as to make room for crazy anime goodness. In my search I have come across some very cool shows – The Big O, Requiem from the Darkness (which I will discuss in a later blog), Samurai 7 and now Gankutsuou. 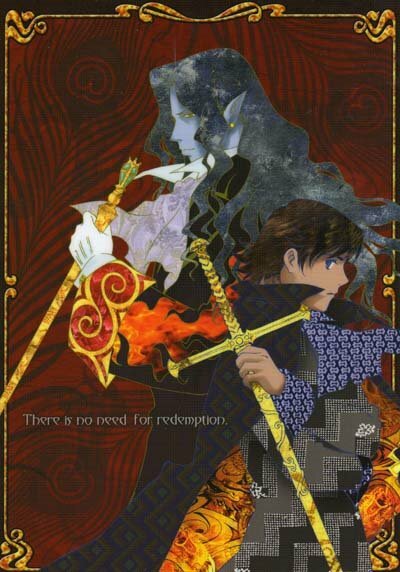 Gankutsuou (also titled “The Count of Monte Cristo”) is a reimagining of the Dumas classic. Now I loved the recent movie adaptation of this classic tale of revenge. But Gankutsuou has surpassed it in deviousness and pure wow. Voted the best anime of 2005, it is easy to see why. This show is just gorgeous to watch. Gonzo have outdone themselves in the CG arena – although there are some points where I wasn’t as impressed by the CG compared to Samurai 7, but Gankutsuou came first, I believe. Overall however, the look is amazing. The decision to do hair and clothing using texture samples rather than standard cell colouring was a bold decision, and the first episode initially had me wondering if I could get used to it, but when you see the Count walk past and his cloak billows out revealing the lush embroidered silk lining, all concern melts away. In typical anime fashion, the series designers decided that Napoleonic France just wasn’t cool enough for a show – so they set it over three thousand years in the future in the year 5054! This is just a gimmick really to allow Gonzo to do what they do best, mixing anachronistic design with futuristic style – look at Last Exile and Samurai 7 to see how these guys are very skilled at making such worlds. This is a series that also doesn’t pull the punches – it has a very dark tone where the Count’s motives are present in a less than trustworthy light. The reason for this is because the story is told from Albert’s point of view – the son of one of the men slated for the Count’s revenge. It does amuse me that Albert has more than a passing resemblence to Ayato from Rah Xephon – except with a little beauty spot/mole. But there is no doubt that the true star of the show is the count himself. Now I’m sure some of you anime fans are shaking your heads at the title of this blog entry. What about Spike Spiegel from Cowboy Bebop? Alucard from Hellsing? Kambei, Kyuzou or any of the other Samurai from Samurai 7? These guys are all fine and very cool Badass Loners. No doubt about it, and it doesn’t really detract from their badassness. This is the man who will free a mass-murderer from public execution only so that he may use said man to set up an elaborate hoax to win the trust of an aristocrat before metting out justice on said murderer before he is able to kill anyone else. This is the Badass Loner who not only lives by his own rules, but ends up making everyone else in an entire galaxy live by his rules solely as part of an insanely elaborate plot to get revenge on the men who took his childhood sweetheart from him and threw him in a prison. This is the man whose theme song is him rocking out to the tunes of the lead singer of The Stranglers, where the chorus goes “You wont see me coming, you wont see me coming… till I STRIKE!” (Which plays at the end of each episode along with a truly psychedelic sequence that just revels in how badass the Count is. On top of all that, he has a Mecha too! And somehow Gonzo pull all this off with a truly brilliant set up that just left me gasping at the pure coolness of the show. What are you doing still reading this? Go watch this series! It is amazing! Mood:In awe of the pretty colours!